While Dragon Quest is known for being a very bare-bones JRPG, the lack of tutorials, general information, and otherwise might leave some players wondering what exactly is going on during their adventure. 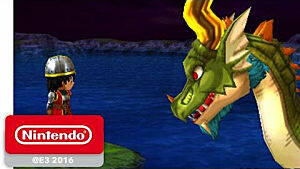 Even some common features such as saving, healing, and more might be confusing to those who have never played a Dragon Quest (formerly Dragon Warrior in North America) title in the past. As such, here's a handy guide that will teach you everything you need to know before starting on your Dragon Quest VII: Fragments of the Forgotten Past adventure! 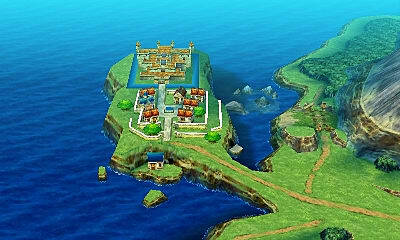 The overworld map in Dragon Quest VII is quite simple to read. 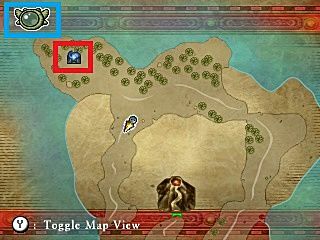 All you need to know about the overworld is the portal home (marked in red) and accessible areas marked with a green line. Meanwhile, any green lines on the map act as entrances. If you can't find out where to go next on an island, try finding new green areas. 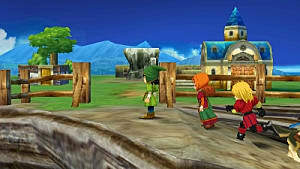 Item Shops: There are four different types of item shops in Dragon Quest VII. From left to right, these are the local shop, item shop, weapon shop, and armor shop. Each of their names are exactly as they suggest, with the exception being the local shops which carry a variety of items from the other three shops. 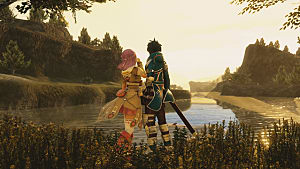 Players should take the time to visit the shops in each world whenever they get a chance, as each carries a unique inventory. Some shops might even carry weapons that can make the boss of that world much easier than going in with what you currently have equipped (i.e. : the Flame Boomerang). Bank: Banks are a common element of Dragon Quest titles. When you fall in battle, a portion of your gold is lost. Thankfully, any money you leave with the bank will be safe. The bank accepts coins in quantities of 1000. Inn: Inns will fully heal your characters for a price that varies depending on the world, your progress through that world, and events that might be going on. However, there are exceptions to this -- including death, poison, and curses -- which will not be cured by sleeping at the inn. Church: Churches are the most important places you'll go on your journey. Not only do they act as your save point, but they are also the place to go to cure poison, reincarnate allies, and remove curses. Another handy tool found at the churches is the ability to see how much experience you need for your party members before they will level up. 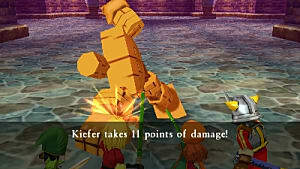 A classic video game staple, treasure chests are the main source of rare items. 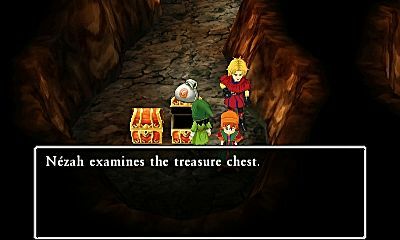 Opening chests is easy as there are few chests that require keys in Dragon Quest VII. They are typically found in dungeons, but can be found in the overworld and houses as well. Not all chests are openable, as they may be used for decoration or otherwise (i.e. : shops). Link isn't the only hero in green clothes who's allowed to smash pots and barrels for money and healing items! 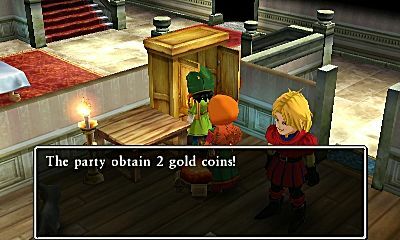 In Dragon Quest VII, smashing pots and barrels is not only fun, but it's a great way to find spare change. You can find some healing items, but rarer items are usually found in other places. 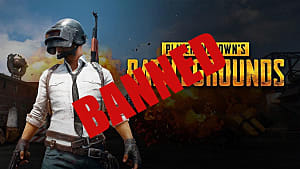 Like other sources of items, despite the fact that the barrels and pots will respawn after you return to the map, the items they contained are scripted. As such, you don't need to break them again. No one's stopping you from doing it anyway, though! Wardrobes, Drawers, Bookshelves, and More! While somewhat unconventional even among JRPGs, Dragon Quest VII actually hides many of its items within everyday places. 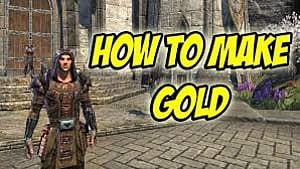 This means you can find armor, weapons, gold, and other useful items in places you wouldn't normally search. As such, it's generally recommended you interact with every single new piece of furniture you find. Also, be sure to scruitinize the ground very carefully. Some stone tablets are actually hidden in plain sight, blending in with various floor patterns such as green grass, yellow sand, blue hallways, and red volcanic stones! Sometimes just talking to people is a great way to find items. 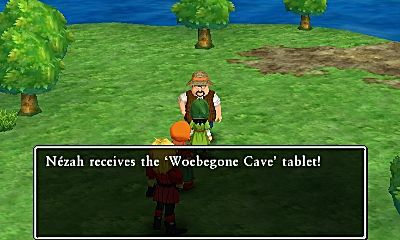 NPCs in Dragon Quest VII are unique in that they can often times point you in the right direction -- not only in terms of progression, but sometimes toward rare items and opportunities as well! This is particularly true of The Haven, as newly recruited monsters will give you tablets to use in the plinth under the town. Press L and R to rotate the camera! While this seems like common sense, turning the camera is very important in Dragon Quest VII. Staircases, treasure chests, and even NPCs might be hidden just out of view. Sometimes these NPCs and world objects won't even render if the camera is facing the wrong way! Pay close attention to what NPCs and other text boxes have to say! 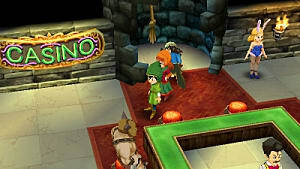 Most games generally have NPCs that say random gibberish, but in Dragon Quest VII many of them will have important info or have information that may lead to secret areas or items. Be sure to read text extra carefully as well, as reading for keywords alone might result in a mindless search for nothing. Talk to your allies! Sometimes your party members will have interesting thoughts to add to a situation. After talking to an NPC or finding an object, press B to talk to your party. 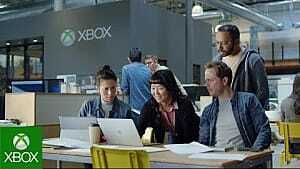 They usually will expand on what the NPC said, or they might even have tips on how to progress through the game. When all else fails, charge! An early way to get stuck in the game is to not try falling into a pit. It seems like an odd thing to be afraid of, but sometimes the areas you can drop through aren't so obvious. If you can't figure out where to go next, try interacting with various objects, tapping the A button on literally everything (including the floor) or simply falling in a hole! Stock up on Chimaera Wings or use the Zoom Spell! Dragon Quest VII's world is quite time consuming to traverse. Using Chimaera Wings or Zoom can speed this up by instantly teleporting you to any town you have already visited - provided that you are in the right time period and out in an area where there is no ceiling. If you are indoors, you can use Maribel's Evac spell to instantly teleport outside. This is particularly useful if you need to get back to town quickly if your party is in a dire state. Look out for healing circles. In later dungeons you might find healing circles randomly placed in hidden areas. These will fully heal your team of all ailments. They stand out quite a bit, and basically look like glowing rings of white light. You'll know if it worked if you see your characters glow for a brief moment after touching them. Watch your character carefully... Some areas (especially from the 3rd island onward) will have poisonous water, clouds, and other traps that will take your health away. If your character flashes red, make sure to avoid similar looking objects at all costs! 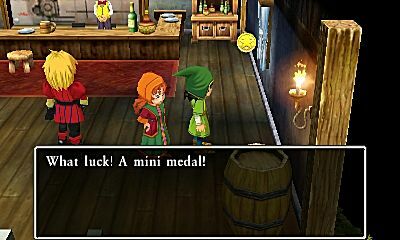 Remember: exploration is the key to success in Dragon Quest VII. Adventures can only take place if you're busy looking around, after all! Just keep these tips and tricks in mind whenever you travel to a new island, and you'll do just fine! 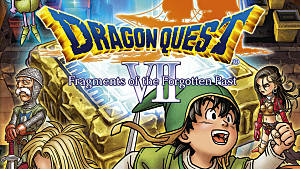 Also, be sure to look out my other guides as we continue to pull apart Dragon Quest VII: Fragments of the Forgotten Past!